What’s your secret weapon for making mouth-watering pasta dishes? Mine’s that I use the best pasta maker – come on in, and I’ll tell you all about it! Did you know the average American (that’s right, someone like you and me) eats around 20 pounds of pasta a year? That’s A LOT of pasta by anyone’s standards. And if we’re already going to eat it by the pound, the least we can do is make sure we’re getting the whole mouth-watering, life-changing, how-did-I-not-try-this-before experience every time! What’s So Special About Homemade Pasta? 3. Does It Stay Put? I can’t, for the life of me, explain to John why it’s so important that we have the best pasta maker stored away in the pantry. "You can buy all sorts of pasta in every single one of our local stores – what’s the big deal?" Mind you, and this is coming from the same guy that can’t get enough of my homemade spaghetti! Homemade Beats Store-Bought By A Long Shot – Okay, this one speaks for itself. Nothing and I do mean nothing, beats homemade pasta! The taste and the freshness are virtually unmatched. You Control The Ingredients List – If you opt for homemade pasta, you can say goodbye to frantically checking labels and ingredients lists, a must for vegans and those with food allergies: Your pasta – your rules. Make Smaller Batches – I usually cook for four or more, but that might not be the case for you. 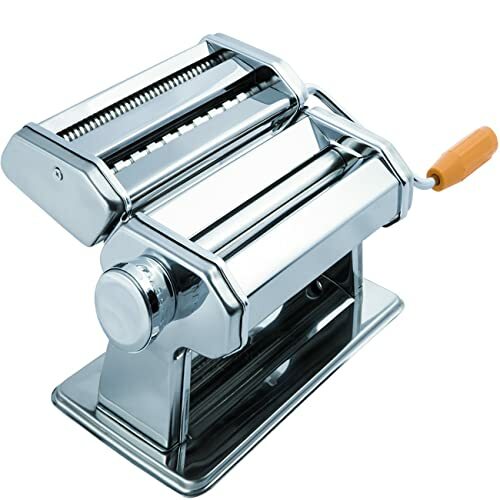 The beauty of a pasta maker is that it allows you to make pasta according to your requirements. 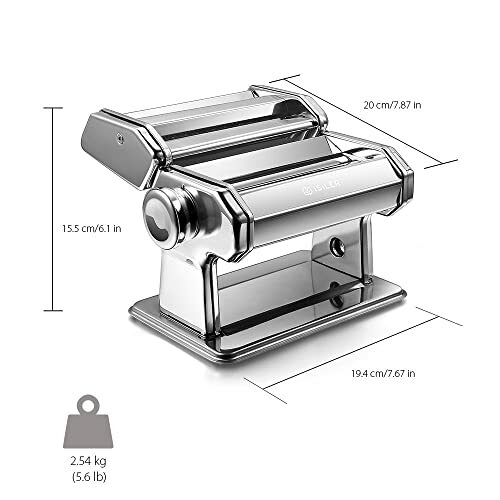 The Options Are (Almost) Limitless – Whether you’re in the mood for ravioli, tagliatelle, fettuccine or lasagna, the best pasta maker will have you covered. Pick your type of pasta as per your dish. Reduced Cooking Time – The initial prep time does take a bit longer than just opening up a package and dumping them in a pot, but it all evens out when you consider that cooking homemade pasta takes less than four minutes on average. The Sense Of Accomplishment – If you’re anything like me, making pasta will be both fun and rewarding experience for you. Plus, you get to humble-brag about it to your family and friends. Make Your Pasta Dishes From Start To Finish With The Best Copper Cookware! The truth is, both types have their strengths and weaknesses – so it all comes down to personal preference. If you plan on feeding your pasta maker fresh dough a few times a week, it’s probably best if you’d go with an electric one. Most motor-powered models will do all the hard work – including mixing, kneading, and extruding the dough – for you, which leaves you more time to focus on making the perfect sauce to compliment your freshly made pasta. 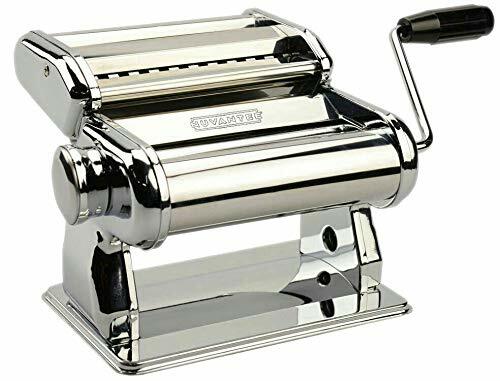 Alternatively, if you’re more of an old-fashioned cook that prefers a hands-on approach – like me – or you don’t make pasta that often, a hand-cranked one should be enough to get you started on your pasta making journey. Extra Tip: Your pasta eating habits are the main deciding factor here – there’s a huge difference between eating pasta once or twice a month and several times a week. Keep that in mind when you make your choice. Working On Your Sauce-Making Skills? Here’s How To Thicken Spaghetti Sauce – The Right Way! A well-built pasta maker should last you for years to come – and hand-cranked ones seem to edge out the electric models easily in that department. Remember: A sturdy, stainless steel body is what you’re after here – it’s, by far, the most durable solution on the market. With careful handling and proper maintenance, there’s no telling how long these things could last! Extra Tip: Pay attention to the warranty, especially if you’re buying an electric pasta maker! So, don’t make the same mistake I did with my previous pasta maker, and pick one that has a sturdy, secure clamp to keep it in place – especially if you opt for a manually powered one! You’re going to have to clean it after every use, anyway, so do yourself a favor and make sure that it doesn’t take forever to take it apart, wipe everything, and put it back together. On that note, dishwasher-safe parts are always a plus! I get that if you love cooking as much as I do, you’ll be willing to spend a bit more to ensure that you’re getting a good-quality kitchen tool, such as the best pasta maker – but that doesn’t mean you should go for an undoubtedly overpriced model. Instead, focus on getting a good bang for your buck, as they say. Good value is what you’re after here, so pay attention to what kind of performance and quality you’re getting for the price. You see, even the most basic of models will be able to produce flat lasagna sheets or slice the dough up into fettuccine or spaghetti. If that’s all you expect it to do, anyway, fine by me – skip the accessories. However, if you want to venture out into the world of specialty pasta, you want all the cutters, disks, dies, and stuffers you can get. 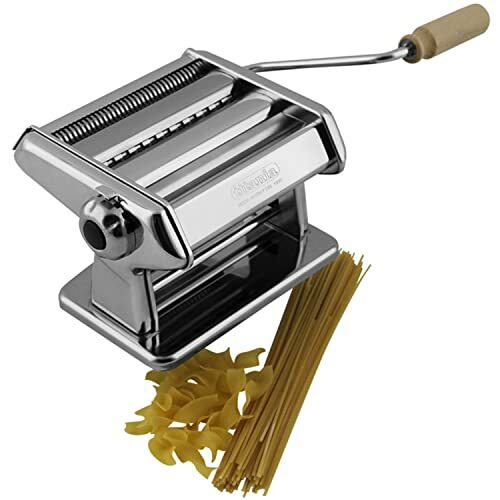 Extra Tip: Compared to manual ones, electric pasta makers usually come with a long list of pasta types you can make. Related: Don’t Throw Out Your Leftovers Just Yet – Here’s How Long Pasta Lasts In The Fridge! You know me, I had to go through a bunch of different pasta makers and test them all out before I could put this list together. But now that it’s here, you can be sure that these are the top 5 best pasta makers currently available on the market! If you want to bring a dash of Italy into your home, there’s no better way to do it than by getting one of these Atlas models made by a trusted Italian manufacturer of pasta makers – Marcato. Seriously, though – ask any pasta lover which one to get, and I can bet they’ll recommend one made by the same manufacturer! The Atlas feels both sturdy and well-made, and it looks fantastic, too – if that’s something that matters to you, anyway. More importantly, it lets you customize your pasta by picking one of ten different thickness levels, while the roller’s rough surface produces the perfect, sauce-absorbing pasta time after time. Oh, and clean-up is a breeze, too – all it takes is a quick wipe with a dry cloth, and that’s it. And while there are 12 different pasta cutting accessories you can use with your Atlas pasta maker, they’re not included in the offer, which means you’ll have to buy them separately. With some of them costing as much as an average low-end pasta maker – yup, you read that right – you better think about it twice before making such an investment. Imperia is another Italian-born manual pasta maker in my round-up, but a slightly more affordable one, compared to the previously reviewed Marcato. So, if you’re set on getting yourself a pasta maker manufactured by one of Italy’s well-known brands, but you’re working with a somewhat tight budget, this might be the perfect choice for you! Even though it doesn’t boast an impressive list of accessories, it’s still suitable for making quite a few different types of pasta – from lasagna to spaghetti, farfalle, and fettuccine. The secret is in adjusting not only the thickness (you get six levels to choose from) but width, as well. If you’re new to the whole make-your-own-pasta thing, you’re going to love the recipe book it comes with – it will make expanding your pasta repertoire a lot easier! Make the wrong move, and I can almost guarantee you that it will fall out. It gets better once you get used to working it, but the risk never goes away. On the plus side, if you ever get tired of the handle, you can get a motor, and turn it into an electric pasta maker. Sometimes it seems impossible to get a quality product at a reasonable price, but not with Nuvantee – this pasta maker will surprise you in all the best ways. The unit features a stainless steel body paired with nickel-plated rollers, which gives off a sense of sturdiness and quality construction. Moreover, I was excited to learn that the gears were heat-treated for added durability – and when it comes to these mechanisms, that’s always a plus. With two different-sized cutters and nine pasta thickness levels to choose from, you’re bound to find the perfect combo for your pasta dish every single time. All things considered, it’s a steal – and one that will take your pasta-making skills to the next level! Oh, and if storage space is an issue for you, you’ll love its small and compact size! The only real downside is the clamp’s size – it’s a bit on the smaller side, which could cause it to get loose, and not keep the pasta maker in place. It doesn’t happen all the time, but I thought I should give you a heads-up, anyway. At first glance, the OxGord does resemble high-end models, such as Mercato – the stainless steel construction and controls are all somewhat similar. The unit comes with three attachments, two of which are pasta cutters. 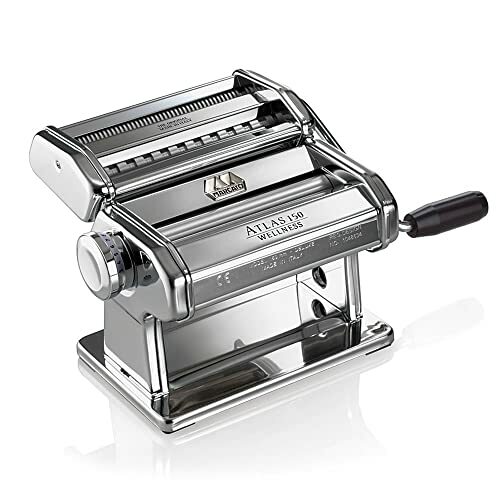 Add the nine selectable pasta thicknesses, and you got yourself a tool capable of making pasta much like the high-end models are – but at a fraction of the price. All the parts, such as rollers and blades, are dishwasher-safe. If you love the idea of making the pasta yourself, but you’re not too thrilled about cleaning all the parts by hand, OxGord is perfect for you! So, if it looks like a duck, swims like a duck, and quacks like a duck, then it probably is a duck, right? Well, not entirely – there are a few things I didn’t like that set this one apart from high-end models. First off, there’s the cheap-looking handle – it could end up being a durability issue, as well. More importantly, the clamp barely holds it down – not a problem if you have someone to help you, but if you’re working alone, I suggest you grow yourself a third hand or something. It’s not Italian-born as many others on this list seem to be, but it’s a decent choice for someone interested in giving homemade pasta a try, nonetheless. The unit is compact and relatively light in comparison to some of the other pasta makers I’ve tested – probably due to its aluminum alloy body – which makes it a perfect choice for those struggling with finding enough storage space for kitchen tools and appliances as it is. I love that it not only lets you choose between nine different thickness levels for your dough but cut your pasta sheets into two widths, too. And while it’s not dishwasher-safe, clean-up is still relatively easy – taking it apart and putting it back together shouldn’t be overly complicated. I like to think of this one as a bike with training wheels – once you get the hang of it, you can always ditch the training wheels, and transition to a more advanced, high-end pasta maker. The clamp feels flimsy, and doesn’t hold the pasta maker in place very well – or at all. After putting them all to the test (to keep things fair, I even made the same type of pasta with each of these models), and considering other factors, including the price tags, I think the Nuvantee Pasta Maker is the best pasta maker currently available on the market. Yes, it’s a manual model, but if you’re not a fan of putting in the elbow grease, you can always "upgrade" it with a motor – it’s up to you!